The other day at Whole Foods, I ate four samples of this life-changing strawberry cream pie — two of which I got myself, one that I bribed my sister Sophie to get for me, and my cousin’s untouched sample which I’m pretty sure she was about to throw away (I have no shame.) After thinking about it all week, I bought an entire pie. And for the next few days, it was all I could think about. If I was at work, I’d wish I was home… eating pie. If we were eating dinner, I’d rush us through so we could get to dessert, ha! Alan’s obsessed with it, too — especially topped with fresh slices of banana. 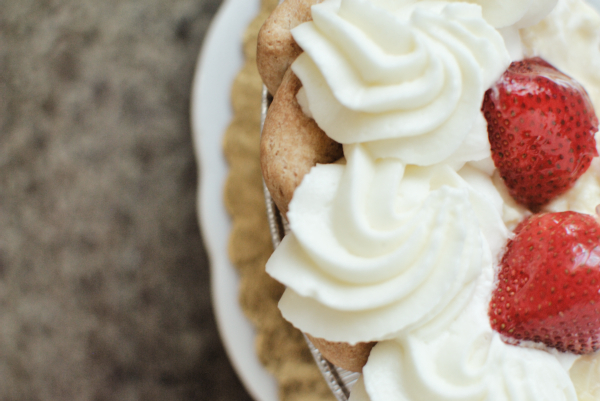 We’d highly recommend it if you’re in the mood for pie! for the love of Pies.